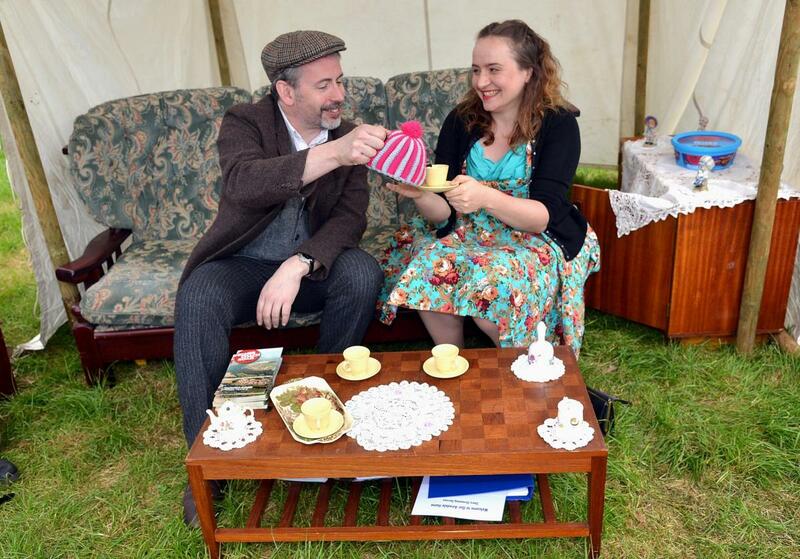 This site documents the work of a community-focused arts research project, centred in West Yorkshire, which ran in two main stages between 2012 and 2017. 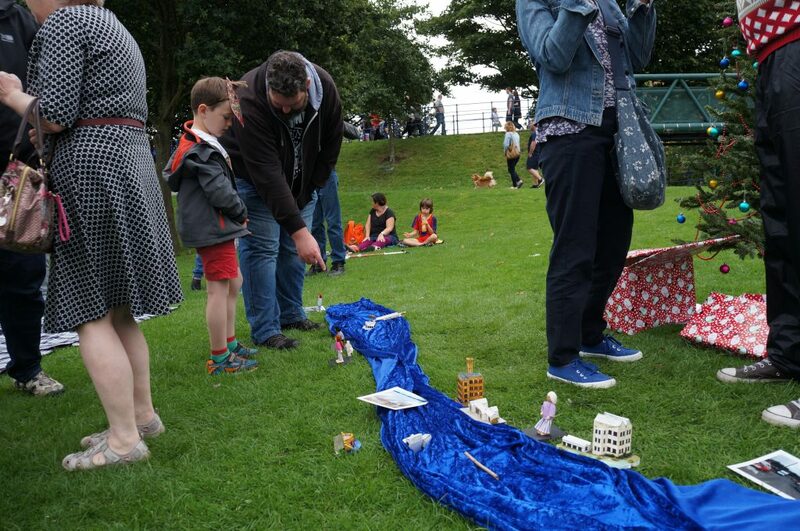 Multi-Story Water was a celebration of the waterways in Shipley and the wider Aire valley – namely the River Aire itself, the Bradford Beck (which joins the Aire at Shipley), and the Leeds-Liverpool Canal (which runs parallel with the Aire down the valley). Our project title reflects a belief that any attempt at public engagement with rivers and canals needs to address a diversity of concerns and experiences, rather than simply attempting to push “single issues” such as flood risk or water quality. The project explored local people’s connections with the water environment — the pleasures water brings, the memories it holds, the risks it poses, and our responsibilities for it. 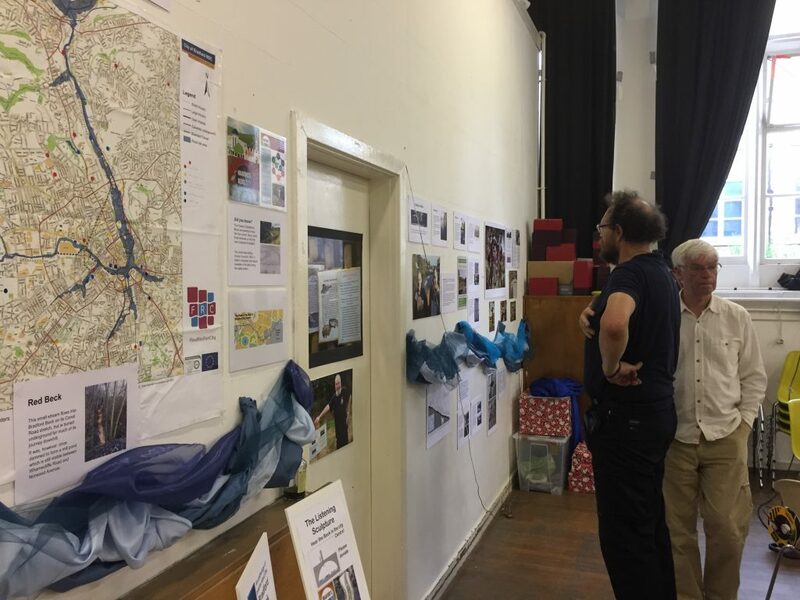 A range of concerns were explored through conversations with and among community members, and this research was then translated into creative activities that could be shared with residents in a kind of continuing ‘feedback loop’. Our creative work is documented under the headings Performances, Films, Galleries, etc, on the menu bar above. You can also trace the development of the project over time in the Blog section of this site. 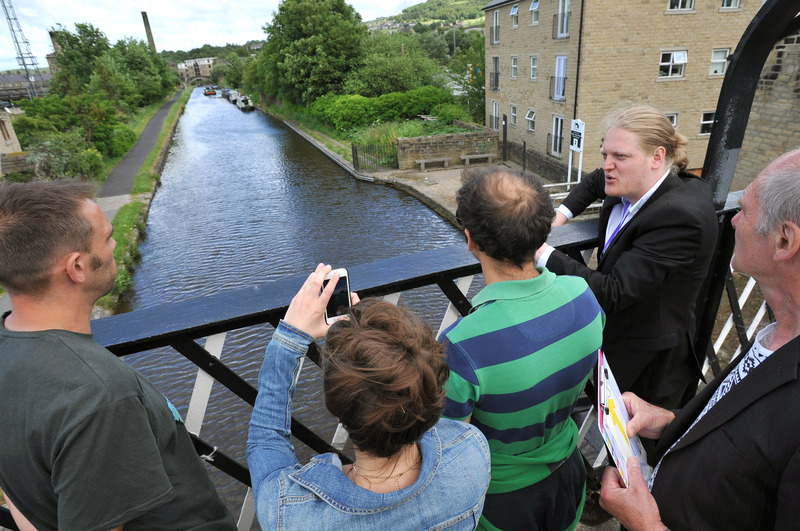 In addition to working with local communities, we also built strong connections with representatives from statutory bodies including the Environment Agency, Bradford Metropolitan District Council, the Canal and River Trust, and Yorkshire Water, and with voluntary organisations including the Aire Rivers Trust and the Friends of Bradford’s Becks. These relationships, too, fed into our creative processes, and enabled us to help foster closer links between the local community and responsible professionals. 1. Multi-Story Water (2012-13) This initial, one-year project — inspired by a brief from the Environment Agency — involved gauging local residents’ awareness of and concerns about the local water environment (particularly awareness of flood risk). 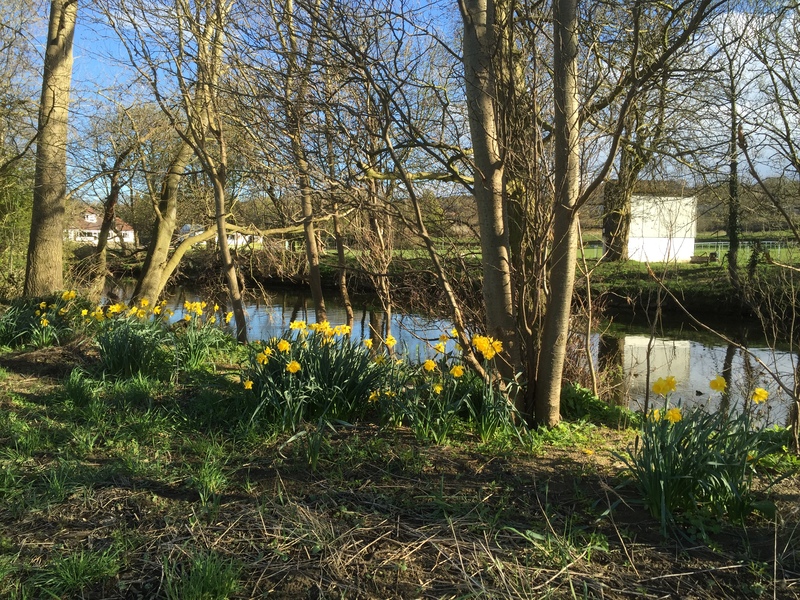 We conducted door-to-door surveys in residential areas close to the River Aire, were led on exploratory walks, and conducted various other forms of local research. The major public outcome of this work a 3-part, site-specific theatrical tour of the area, which bore the same title as the overall project. 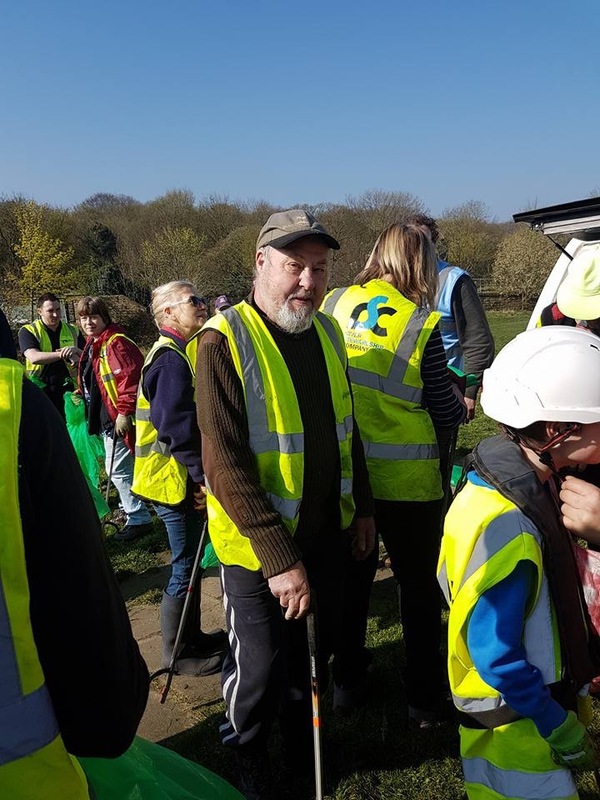 Related activities included: a community party on the Higher Coach Road estate; working with students from Shipley College on a 3-D digital imaging project, and working with Kirkgate Community Centre to present Shipley River Day. We also made a short film, Wading to Shipley, in support of the Friends of Bradford’s Becks, and worked with Bradford Council to create Blue Mirror – a performance with primary school children about Bradford Beck, staged in the city centre’s Mirror Pool. A full, printed report on the 2012-13 project can be accessed here. In the Higher Coach Road area (a 1950s council estate that runs next to the Aire, west of Roberts Park), we built on contacts previously developed during the 2012-13 project. Conversations with residents led to their establishment of the Higher Coach Road Residents Group, which now actively advocates for this distinctive riverside community. Partnering with this group, we developed creative activities including a riverside Meadow Meander, and a celebration of the estate’s heritage, Welcome to Our Airedale Home. We also supported their request for ongoing children’s art workshops, which led to some fantastic environmental art (see Higher Coach Road Young Artists) and the making of two short films (Floody and Salt Lions). Engagement with the Dockfield area (sandwiched between the river and canal, to the east of Bradford Beck) proved trickier, because we were hampered by a series of personal and logistical issues (e.g. Kirkgate Centre having its community development mandate for this area removed by Bradford Council, for unrelated reasons). However, we built up some strong relationships in the area, and helped residents relay some key concerns to council representatives. Our research here informed the development of a walking tour, Seven Bridges, and a play for homes and pubs, This Island’s Mine. The short film Dockfield Delight is a kind of spin-off from the latter — a little love letter to the area. 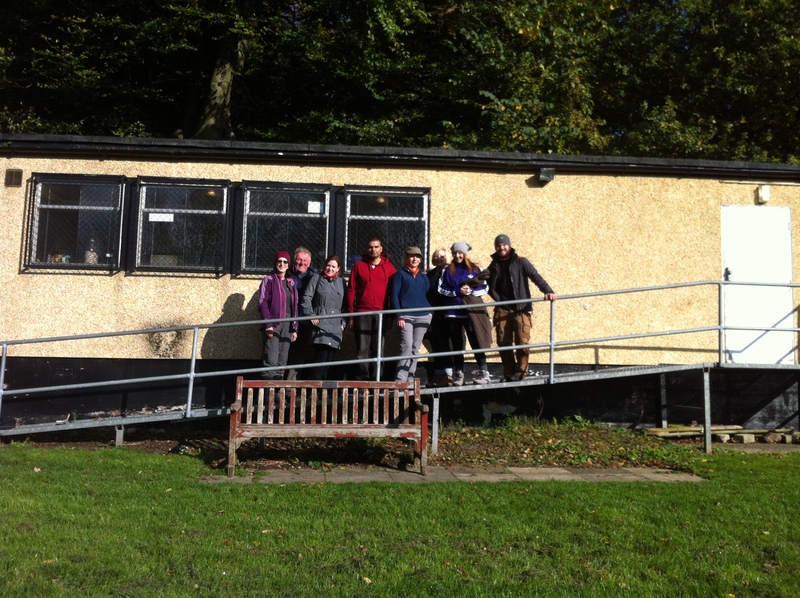 We also engaged extensively with residents in Crosley Wood (a canalside estate consisting of three concrete tower blocks just to the west of Shipley, in Bingley). 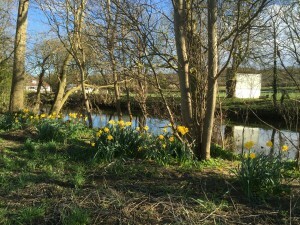 The day-to-day housing difficulties faced by residents here are very pronounced — so much so that the proximity of the canal is seen by many residents as the single positive thing about living there. Our work in Crosley Wood was mostly on quite a personal, even one-to-one basis with residents. This is reflected in High Rise Damp, a short film documenting some of the water issues faced by one family on the estate. The film helped open a dialogue with Incommunities, the social housing provider. Festivals. Throughout the duration of the Hydro-Citizenship project, we worked not only in particular neighbourhoods but also to highlight connectedness between waterside communities in the Shipley area. To achieve this, we worked in particular with local festivals, which draw a variety of audiences to their annual celebrations. 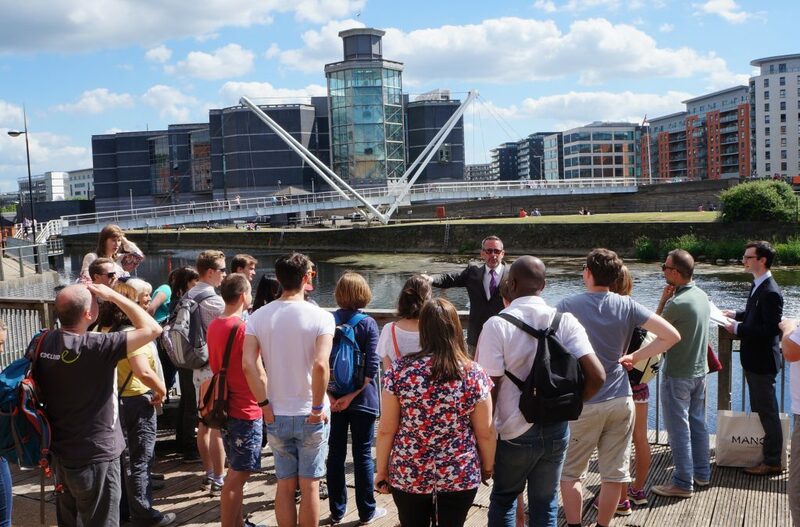 In 2015, when Shipley Street Arts Festival took the town’s rivers and canal as their theme (partly in response to our own previous work), we developed the walking tour Seven Bridges, and collaborated on various other contributions to the festival. Collaborating with Higher Coach Road residents, we presented two events under the title Welcome to our Airedale Home (2016 and 2017), as contributions to Saltaire’s World Heritage Weekend (annually in April), and in 2017 screened the short films Floody and Salt Lions as unsolicited ‘fringe’ contributions to Saltaire Arts Trail (May). Finally on the festival front, the Multi-Story Water team also made annual trips twelve miles downstream to Leeds, to participate in the Leeds Waterfront Festival. (We made strong links here because of our engagement with professional stakeholders such as the Environment Agency and the Canal and River Trust, whose Yorkshire offices are in Leeds.) Performances included: the waterfront walking tour Seven Bridges (Leeds) in 2015 (timed to coincide with the identically named piece in Shipley); After the Flood in 2016 (another response to the Boxing Day flood, later exhibited at Leeds Industrial Museum as a film, this was an attempt to communicate to festival-goers some of what we’d learned from the ‘experts’ about flood risk management strategies); Weir Science in 2017 (a collaboration with the partners in the Leeds Flood Alleviation Scheme (FAS) to showcase their new state-of-the-art collapsing weir at Crown Point). The success of this last piece subsequently led to MSW contributing to initial consultation events for FAS2 (the second stage of the scheme, to be developed between Bradford and Leeds city centre). 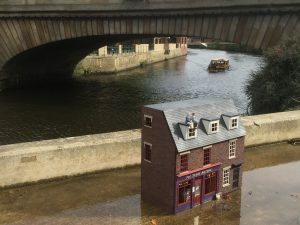 Flood: our original Multi-Story Water project began as an attempt to respond to a challenge from the Environment Agency: can site-specific arts practices be used as a means to engage people in a creative conversation around questions of river awareness and potential flood risk in their local area? 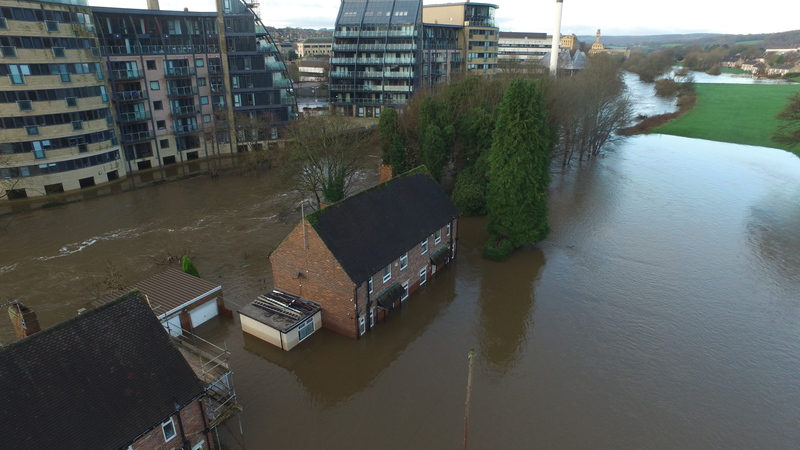 It seems appropriate, then, that while the project went on to explore many other angles on the Aire valley’s waterways, the events of Boxing Day 2015 led us strongly back to flooding as a key concern. 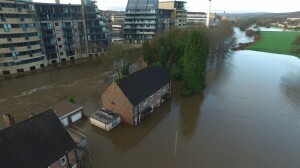 By the time this happened, our understanding of the area, and connections with residents and organisations, meant that we were able to respond from a variety of angles. In addition to creating the performances and films mentioned above (After the Flood, Too Much of Water, Weir Science, Floody), we collaborated with Shipley’s Kirkgate Centre to host a ‘community conversation‘ in the wake of the floods, blogged extensively about the experiences of various local residents and business-owners (see blog entries under ‘Flood’ tag), and even solicited an engineering analysis of the the weir at Baildon Bridge, in response to a suggestion by the secretary of Baildon Woodbottom Working Men’s Club, who suspected that — as in Leeds — dropping the weir might aid flood alleviation for the club and local residents. It turned out that it wouldn’t… but still, that episode represented the project’s ethos at its best, bringing together community members and professional expertise in the hope of making a positive difference. Multi-Story Water, and the wider Hydro-Citizenship project to which it contributed, was a collaboration between researchers in the arts, humanities and sciences (see People page on menu bar). Our funders, the Arts and Humanities Research Council, are strongly committed to the idea that the arts as well as the sciences have an important role to play in understanding and communicating the human dimensions of environmental questions. How do we feel about the landscapes and environments around us, whether built or natural? How have they changed over time, and how might they change in the future – in an era of climate change and other ‘known unknowns’? And what are the opportunities, as well as the risks, presented by these uncertain times? We are interested in inviting Mr. Bottoms to speak at a training seminar held by the US Army Corps of Engineers on May 1, 2018 in Indianapolis, Indiana. Please contact me at the email below so that we can discuss availability and other details.